Overcoming A 'Long, Bitter Relationship,' Grand Canyon And Tribes Mark Centennial When the Grand Canyon became a national park 100 years ago, native tribes who lived in the canyon were pushed aside. Now the park service is working with them to design a new cultural heritage site. The view of the Grand Canyon from the top floor of Desert View Watchtower on the southeastern rim. 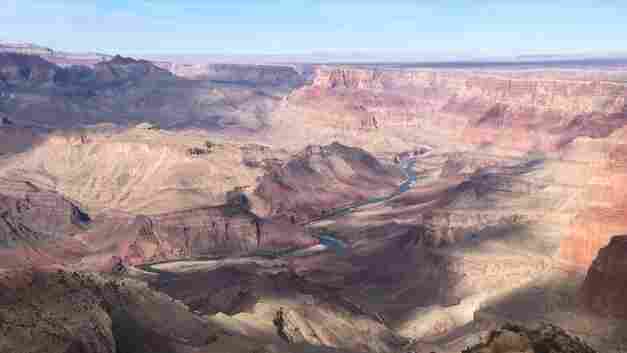 Eleven tribes have traditional ties to the Grand Canyon. Over the last century the geologic wonder of the Grand Canyon has inspired poets, painters, archaeologists and biologists. This week — on Tuesday, Feb. 26 — the Grand Canyon celebrates its 100 years as a National Park. But long before it became a national park, the Grand Canyon was a place many Native Americans called home. That's what Carletta Tilousi still calls it. "Most Americans think Native Americans are gone but we're still here," Tilousi says. Tilousi is a Havasupai council member and grew up in the Grand Canyon. "This is the home of Native Americans and our stories need to be told," Tilousi says. "I think Havasupai we've been ignored for a long time." It's been a really long, bitter relationship with the park. In the late 1800s the federal government sequestered the Havasupai to a side canyon. It wasn't until 1975 that the tribe was given back some of their ancestral land. "The park forcefully removed my family — my great aunts and my great grandfather," Tilousi says. "And that really made me personally very angry as a child. It's been a really long, bitter relationship with the park." Today the National Park Service is required to consult with the 11 tribes traditionally associated with the canyon when making changes that might have an impact on them. But only in the last decade have tribal leaders been willing to sit down with park staff. In those meetings they've asked the park for an opportunity to tell their stories. They hope to do so at a new Desert View Inter-tribal Cultural Heritage Site being designed by the National Park service to mark the occasion of the park's centennial. Architect Mary Colter modeled the Desert Watchtower, a 70-foot-tall structure on the southeastern rim of the Grand Canyon, after an Ancestral Puebloan building. "This whole project is propped up on trust that we will do what we say we will do," says Jenn O'Neill, the park's partnerships and planning coordinator. 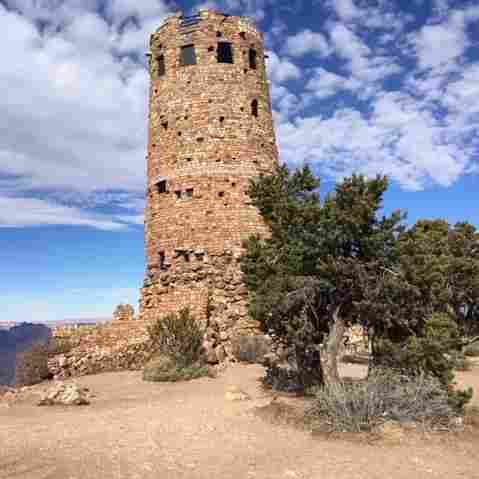 The park has also preserved some existing cultural heritage sites in the canyon, including the Desert View Watchtower on the southeastern rim. The 70-foot tall stone building is modeled after an Ancestral Puebloan dwelling. 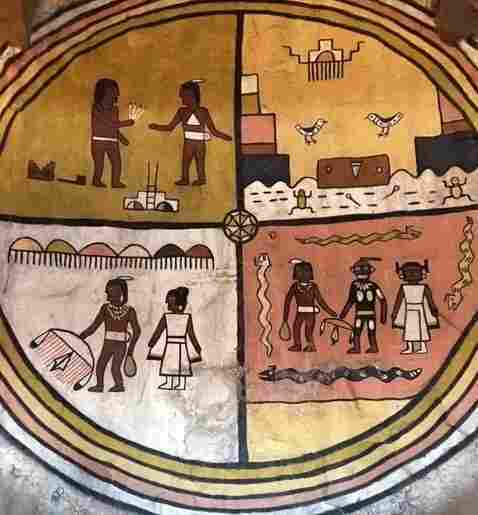 Inside the building, the park is restoring renowned Hopi artist Fred Kabotie's murals. "And they have spent the last three years cleaning with Q-tips and brushes every square inch of the murals," O'Neill says. She is hopeful that, once this project is up and running, the rest of the park will follow suit by providing other places for tribes to share their history with visitors. "We don't want to dispatch all things native to the farthest corner of the park," O'Neill says. "We want to create a program that works and is sustainable and then it will move into the larger park." This project is welcome but there are still some key tensions between the park and tribes. For instance the park currently only lets Native artists sell their artwork under strict regulations. They're limited to just selling crafts they've shown visitors how to create in cultural demonstrations. Mable Franklin, who is Navajo, says the next step is economic empowerment. "We would like to see our communities put their wares [on display for sale in the park] and generate revenue from that because in our community we have a lot of people that are vendors and that's their way of life and that sustains them out here," Franklin says. Until that rule changes, Franklin hopes the six million annual visitors to the Grand Canyon will consider taking a short side trip just 30 miles east of the park to the Navajo Nation. There, in the community of Cameron, artists can earn a living selling all of their work.